Jakobshavn Isbræ (Jakobshavn Glacier) is moving ice from the Greenland ice sheet into the ocean at a speed that appears to be the fastest ever recorded. Researchers from the University of Washington and the German Space Agency (DLR) measured the dramatic speeds of the fast-flowing glacier in 2012 and 2013. The results are published today in The Cryosphere, an open access journal of the European Geosciences Union (EGU). "We are now seeing summer speeds more than 4 times what they were in the 1990s on a glacier which at that time was believed to be one of the fastest, if not the fastest, glacier in Greenland," says Ian Joughin, a researcher at the Polar Science Center, University of Washington and lead-author of the study. They note that summer speeds are temporary, with the glacier flowing more slowly over the winter months. But they add that even the annually averaged speedup over the past couple of years is nearly 3 times what it was in the 1990s. This speedup of Jakobshavn Isbræ means that the glacier is adding more and more ice to the ocean, contributing to sea-level rise. "We know that from 2000 to 2010 this glacier alone increased sea level by about 1 mm. With the additional speed it likely will contribute a bit more than this over the next decade," explains Joughin. Jakobshavn Isbræ, which is widely believed to be the glacier that produced the large iceberg that sank the Titanic in 1912, drains the Greenland ice sheet into a deep ocean fjord on the coast of the island. At its calving front, where the glacier effectively ends as it breaks off into icebergs, some of the ice melts while the rest is pushed out, floating into the ocean. Both of these processes contribute about the same amount to sea-level rise from Greenland. As the Arctic region warms, Greenland glaciers such as Jakobshavn Isbræ have been thinning and calving icebergs further and further inland. This means that, even though the glacier is flowing towards the coast and carrying more ice into the ocean, its calving front is actually retreating. In 2012 and 2013, the front retreated more than a kilometre further inland than in previous summers, the scientists write in the new The Cryosphere study. In the case of Jakobshavn Isbræ, the thinning and retreat coincides with an increase in speed. 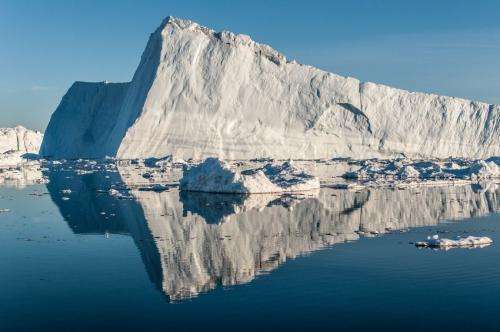 The calving front of the glacier is now located in a deeper area of the fjord, where the underlying rock bed is about 1300 metres below sea level, which the scientists say explains the record speeds it has achieved. "As the glacier's calving front retreats into deeper regions, it loses ice – the ice in front that is holding back the flow – causing it to speed up," Joughin clarifies. The team used satellite data to measure the speed of the glacier as part of US National Science Foundation (NSF) and NASA studies. "We used computers to compare pairs of images acquired by the German Space Agency's (DLR) TerraSAR-X satellites. As the glacier moves we can track changes between images to produce maps of the ice flow velocity," says Joughin. The researchers believe Jakobshavn Isbræ is in an unstable state, meaning it will continue to retreat further inland in the future. By the end of this century, its calving front could retreat as far back as the head of the fjord through which the glacier flows, about 50 km upstream from where it is today. For 90% of the Earth's geologic history there were no permanent ice caps. That being said we should be phasing out coal, gas, and oil fired power plants as quickly as possible to realistic alternatives, because we ARE having an impact and there is no need for it.